NEUGAIN is a combination of (Minoxidil / Finasteride) is a Topical Solution and Oral Tablets. 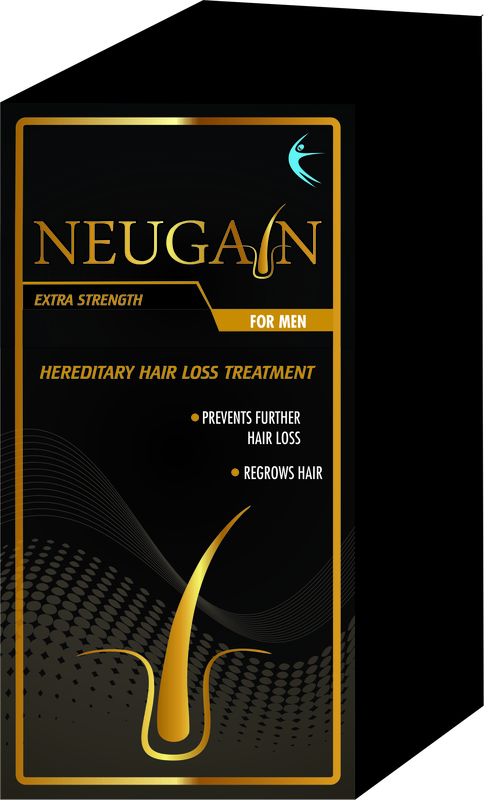 NEUGAIN is used to regenerate and boost hair growth in men and women suffering from Alopecia. Its mechanism of action is improving blood flow in the scalp and reducing the DHT concentration. This helps to stimulate the growth of new hair. Therapeutic benefits are due to both of the active ingredients working in different ways. Minoxidil exhibits multiple mechanisms of action, which include dilating the blood vessels (vasodilation) that occur around the hair follicl es and stimulating the active growth phase of anagen the follicles results in thicker hair growth. The other ingredient contained in this solution is finasteride, and it is classified as a 5-alpha-reductase inhibitor. It inhibits the action of the enzyme responsible for converting testosterone (a type of androgen) into dihydrotestosterone (DHT, a more potent androgen which can affect the follicles and trigger hair loss). A reduction in the levels of DHT can therefore help to prevent the balding process from progressing, while at the same time helping to stimulate new hair growth. Patients using this treatment may notice an improvement in hair growth after 4 months of treatment. NEUGAIN (Minoxidil/Finasteride) is provided as a topical solution and oral tablets. Each bottle contains 60ml. Men affected by male pattern hair loss (MPHL) also known as alopecia should seek the advice of their physician specializing in dermatology and hair loss in order to find the most suitable and effective treatment option. Your physicians will most likely advice the application of 1ml, twice per day and the total daily dose should not exceed 2ml. Apply the solution directly to the bald area of the scalp, making sure that the affected area is thoroughly dry prior to application. Should any serious adverse events occur during treatment, you must immediately consult your physician. NEUGAIN (Minoxidil/Finasteride) is a topical solution and oral tablets in the treatment of alopecia. Under no circumstances should it be applied to anywhere on the body except the area of the scalp affected by hair loss. Withdrawal of treatment could lead to a relapse of hair loss, and your hair may eventually revert to the way it was before treatment started, and the balding process may also continue. It is important that your hands are washed after application of the solution to the scalp. This will prevent the solution from accidentally coming into contact with other areas of the body and causing unwanted hair growth.